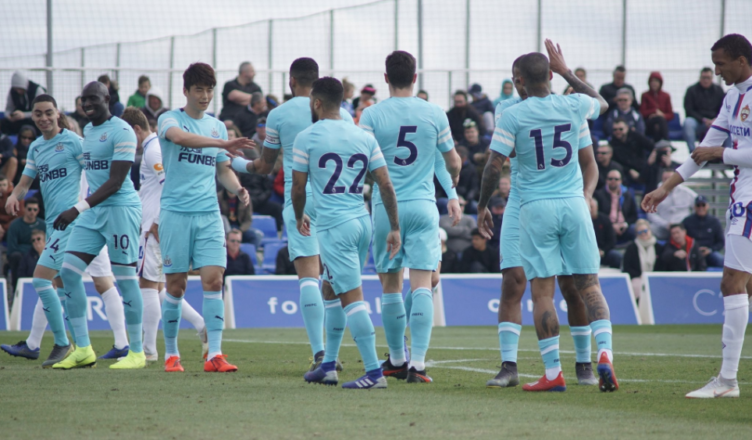 Watch Rondon’s goal & match highlights from Newcastle 1-1 CSKA Moscow – NUFC blog – Newcastle United blog – NUFC Fixtures, News and Forum. It wasn’t your usual Saturday game for Newcastle today, with us swapping an afternoon kick off at St James’ Park for an 11am start at the Pinatar Arena in Spain up against Russian giants CSKA Moscow. It was a good run out, however, with Rafa giving 45 minutes to 22 players in this one. The first half featured Darlow, Yedlin, Schar, Lascelles, Lejeune, Barreca, Ki, Diame, Kenedy, Almiron and Rondon. There were several promising performances, with Yedlin impressing down the right, Diame looking in good shape, Almiron looking lively and Rondon bagging another goal – however Kenedy had an absolute shocker (see clips below). What on earth is Kenedy playing at here.. The second half saw Rafa make 11 changes, seeing us revert to a 4-2-3-1 with Woodman, Manquillo, Fernandez, Dummett, Ritchie, Hayden, Longstaff, Perez, Muto, Atsu and Joselu all coming on. Muto looked rusty – despite almost winning it late on – Joselu was his usual self (see his woeful attempt at goal below), but Ritchie looked bright down our left, Longstaff put in another mature display and Dummett looked solid on his return. A decent run out for Newcastle, with Almiron and Barreca putting in steady displays, as well as the likes of Diame, Ki, Darlow and Dummett all getting 45 minutes under their belts after spells out through injury. Kenedy was worryingly poor, Muto and Ki looked a little rusty and Joselu reminded us just how important it is that Rondon stays fit, but it was a solid workout for us in the main.